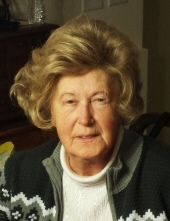 Anna Fedor, age 79, passed away at her home on January 26, 2019. She was born January 1, 1940 in Gdansk Poland to her parents Edmond and Stella Hass. Anna is formerly of Crystal Lake, IL and has lived in Sugar Camp for the past 24 years. She enjoyed carving, painting, cooking, gardening and was a member of an art club in Arbor Vitae. Anna was preceded in death by her son Mark on January 4, 2019. She is survived by her husband of 53 years John; daughter Sandy (Brennan) Lewis of Wonder Lake, IL; daughter in law Mary Fedor of Aurora, IL; and 6 grandchildren. A memorial service will be held at 11 AM on Saturday February 2, 2019 at St. Kunegunda of Poland Catholic Church in Sugar Camp, WI. Visitation will be held one hour prior to the service. To plant a tree in memory of Anna Fedor, please visit our Tribute Store. "Email Address" would like to share the life celebration of Anna Fedor. Click on the "link" to go to share a favorite memory or leave a condolence message for the family.